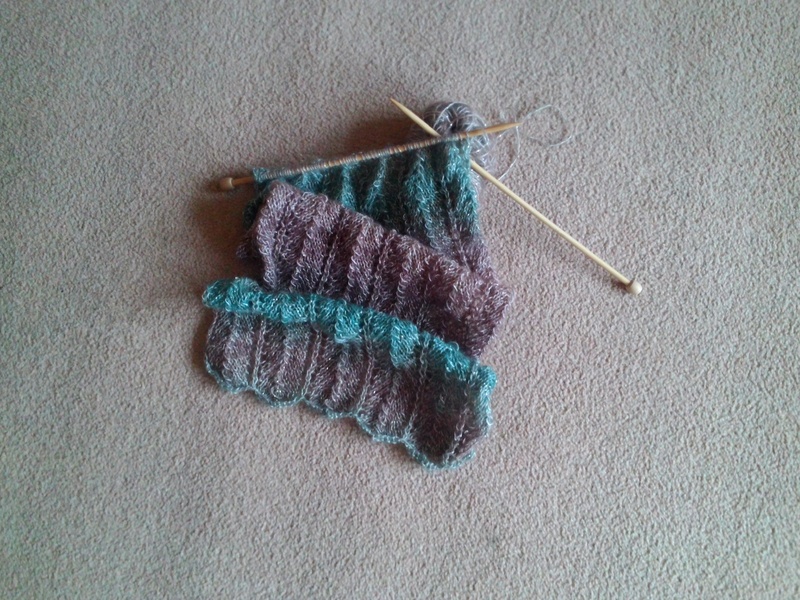 Knitting more in my mind than in actuality. Anyone else not settling down to it? There’s always so many other things to be done this time of year! Who am I kidding? Just myself. I could pick up the needles but find myself getting distracted by searching for patterns and yarn online. If I actually downloaded or bought all the patterns I am drawn to I would have enough to keep me going for years! Likewise if I actually knitted my stash – but as any true knitter knows, they will never get down to not having a stash! ha ha! My green tunic sits across the lounge peeking out of the top of it’s project bag. It showed promise but it has temporarily lost momentum. I started a man’s hat for a Secret Santa gift – it was supposed to be a quick knit and I was going great guns on it, steady for two train journeys in one day. Then ….. I found out my Secret Santa gift was to be for a girl in the office – trust me to have taken a gamble – so man’s hat on hold and girl’s hat cast on and half done last night. Of course some could ask why did I start or why didn’t I start a unisex hat? I ask myself that – guess I got carried away with the yarn to hand (a happy half hour perusing my stash!) Besides, when I was given the girl’s name I realise she is very ‘girly’ and just needs a ‘girly’ hat! One week to go – easy peasy – it will be off the pins by end of the day tomorrow. Then to decide on which embellishment – flower or pompom? The weekend has been busy, apart from the crafting. Hubby full of cold so he needed some TLC . Teenager tetchy so he needed a little TLC but a more hands off approach. Christmas decs up, courtesy of hubby, who finds it hard to sit and do nothing but at least he agreed not to leave the house (my idea of speeding up his recuperation, staying at home that is, probably his idea of hell!) When son and I popped out to pick up hubby’s Christmas gift he was agast not to be invited, but luckily we had a very good excuse to stop him coming. So, weekend over and it will soon by Monday.